We offer several competitively priced packages. Help you determine your survey sample target audience. Whom you will survey/poll. Establish the goal of the project. What single, potentially news-relevant item you want to learn in this survey. There are no guarantees. Create the online questionnaire - What will be asked. Test the questions and the survey. Provide you with a unique survey link to online survey – How we ask the questions. Analyze the data – Produce a clear, easy to understand one-page report on your single survey topic giving you survey data results, by gender. The answers by gender feature can be an interesting addition for an upcoming press release and other social media plans. You might" Tweet" about it, too. The Mini Survey Services Package begins at $499 US, to be prepaid via Papal. Notes: Assumption is that you have an existing email database you will be sending your survey link to. If zero people complete a survey, there are zero results. Reminder: There are no guarantees that the survey results will be what you want. Survey link stays active for a maximum of 30 days. Larger survey projects such as Customer Satisfaction, Constituents Survey, Education, and Employee are individually priced by project. More about other internet polling and marketing survey services. This package can provide three times more facts and stats than the Mini Package. Establish the goal of the project. What single, potentially news-relevant item you want to learn in this survey. Plus a second seasonal, holiday, topical survey question that’s relevant to your industry and could potentially appeal to a busy reporter. There are no guarantees, but a seasonal or highly searched keyword, can increase your survey’s appeal. If zero people complete a survey, there are zero results. Provide you with a unique shortened URL survey link to this online survey. Shortened urls are useful in emails and micro blogging sites such as Twitter. Provide an Opinion Central Survey widget (graphic/jpeg) for your website that can be linked to this survey. This survey link stays active for a maximum of 30 days. Analyze the data – Produce a clear, easy to understand two-page report on your two survey topics. Page 2 is survey data results by these groupings gender, age, and geography. You can include in upcoming press release and other social media plans. This package can provide up to three times more facts and stats than The Mini Package. There are no guarantees. 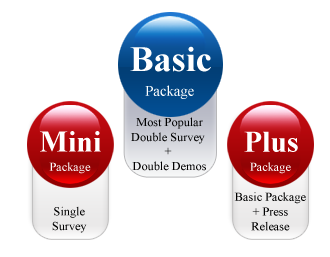 The Basic Survey Services Package B begins at $699 US, to be prepaid via Papal. Assumption: you have an existing email database you will be sending your survey link to and/or website with enough traffic for survey results. Reminder: There are no guarantees that the survey results will be what you want. If zero people complete a survey, there are zero results. Survey link stays active for a maximum of 30 days. Prices and packages are subject to change without notice. Signed services agreement is required. Package fees are non-refundable. Analyze the data – Produce a clear, easy to understand one-page report on your double survey topic giving you data results groupings gender, age, and geography. You can include in upcoming press release and other social media plans. Professionally Marketing Feature includes: A professionally written press release, excellent way to round out a complete marketing communications campaign. More things to tweet and blog about. The Plus Survey Package C begins at $899 US, to be prepaid via Paypal. Assumption: you have an existing email database you will be sending your survey link to and enough daily site traffic to yield enough completed surveys. Reminder: There are no guarantees that the survey results will be what you want.